One of Ireland's most successful musicians, Dubliner Finghin Collins was born in 1977 and studied piano at the Royal Irish Academy of Music with John O'Conor and at the Geneva Conservatoire with Dominique Merlet. Winner of the RTÉ Musician of the Future Competition in 1994 and the Classical Category at the National Entertainment Awards in 1998, he went on to achieve major international success by taking first prize at the Clara Haskil International Piano Competition in Switzerland in 1999. Since then he has developed a flourishing international career that takes him all over Europe, the United States and the Far East. Collins has performed with such orchestras as the Chicago Symphony Orchestra, Houston Symphony Orchestra, London Philharmonic Orchestra, Royal Philharmonic Orchestra, Rotterdam Philharmonic Orchestra, Orchestre de la Suisse Romande, Gulbenkian Orchestra, Seoul Philharmonic Orchestra and the City of Birmingham Symphony Orchestra, garnering consistent praise from critics and public alike. Conductors with whom he has collaborated include Frans Brüggen, Myung-Whun Chung, Christoph Eschenbach, Hans Graf, Emmanuel Krivine, Nicholas McGegan, Gianandrea Noseda, Sakari Oramo, Tadaaki Otaka, Heinrich Schiff, Leonard Slatkin and Vassily Sinaisky. Performances across Europe have included such prestigious venues as Symphony Hall Birmingham, Wigmore Hall, Barbican Hall and Cadogan Hall, London, the Concertgebouw Amsterdam (both halls), Théâtre du Châtelet and Salle Cortot Paris, Salle Molière Lyon, Liederhalle Stuttgart, Auditorio Nacional Madrid, Palao de la Musica Valencia, Gulbenkian Hall Lisbon, Sala Verdi Milan, Teatro Manzoni Bologna, Konzerthaus Berlin, Konzerthaus Vienna, Philharmonic Hall Warsaw and the Auditorium Stravinski Montreux. He has also performed at Carnegie Hall, New York and the Kennedy Center, Washington DC, as well as at both Ravinia and Gilmore Festivals in the USA. European Festival appearances include the Piano Festival at La Roque d’Anthéron (France), Klavier-Festival Ruhr and Schleswig-Holstein Musik Festival (Germany), Lockenhaus Festival (Austria), Delft International Chamber Music Festival (Holland), Chopin Festival (Poland), Musical Olympus Festival (Russia), Sommets Musicaux de Gstaad (Switzerland), as well as the Mostly Mozart Festival (UK). Chamber music plays a significant role in his musical life and he has collaborated with London Winds and the Aviv, Callino, Chilingirian, ConTempo, Ebène, Shanghai, Skampa, St Petersburg, Vanbrugh, Vertavo and Vogler String Quartets. Regular recital partners include cellists Han-Na Chang and Marc Coppey and soprano Lenneke Ruiten. In January 2010 Collins made his solo début in the National Concert Hall's Celebrity Recital Series in Dublin. In September 2010 he made his second critically-acclaimed appearance at the BBC Proms at the Royal Albert Hall in London, performing with the BBC Philharmonic under Gianandrea Noseda. . In May 2013 he completed his three-year tenure as first ever Associate Artist of the RTÉ National Symphony Orchestra, rounding off his cycle of the complete Mozart and Beethoven piano concertos. The position as Associate Artist of the RTÉ NSO has been hugely significant, affording him opportunities to conduct the orchestra, to commission a new work by Irish composer Deirdre Gribbin and to direct programmes of multiple piano concertos from the keyboard. This summer Finghin Collins makes his début in the London Pianoforte Series at Wigmore Hall in London in June, and at the Aspen Music Festival in the USA in August. He also performs at Cully Classique and the Festival de Bellerive in Switzerland. Engagements in the 2013/14 season include appearances with the Charlotte Symphony Orchestra, Budapest Festival Orchestra, London Chamber Orchestra and the Anhaltische Philharmonie Dessau. Over the past decade Collins has developed a close relationship with Claves Records in Switzerland, recording two double CDs of Schumann’s piano music (which won numerous awards including Gramophone’s Editor’s Choice in 2006), and more recently recording a CD of works for piano and orchestra by Charles V. Stanford with the RTÉ NSO (Editor's Choice, May 2011). In May 2013 RTÉ lyric fm launched his latest recording of four Mozart piano concertos with the RTÉ National Symphony Orchestra. Finghin Collins has been Artistic Director of the New Ross Piano Festival since its inception in 2006, and is also Artistic Director of Music for Galway since January 2013. 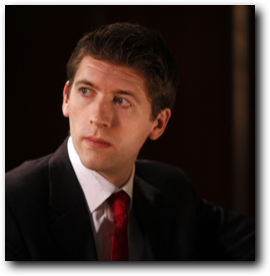 Currently a member of the Board of Directors of the Dublin International Piano Competition, he has also been a member of the Board of Directors of the National Concert Hall (2001 - 2006), Musician-in-Residence in South Dublin County Council (2005 - 2008) and Artist-in-Residence in Waterford Institute of Technology (2005 - 2009). Of Finghin Collins as soloist, little needs to be said that has not been said before: he is exceptionally fluent, exceptionally intelligent, exceptionally sensitive, responding to every possible nuance that Stanford prescribes.